Dart designed the Iron Eagle big-block marine heads for high-performance marine applications and outfitted them with Inconel exhaust valves to withstand the extended running time and temperatures typical of marine usage. 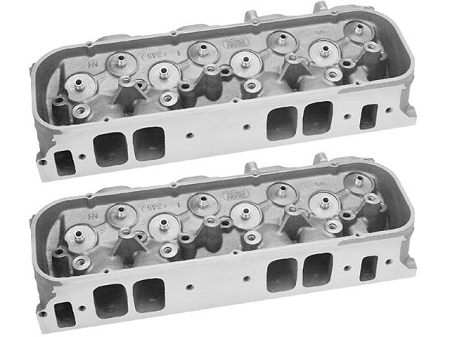 The marine iron eagle heads are available in either a 308cc or 345cc intake port and are fully assembled. Please choose the correct set from the drop down list. Valve angles rolled two degrees from stock to reduce chamber volume and improve flow. Precision combustion chambers for optimal burn control. Inconel exhaust valves for increased durability at high temperatures. Multi-angle intake seats, radiused exhaust seats and precision cast valve bowls produce excellent air flow without hand porting or expensive CNC machining. Exhaust ports raised .300 to improve flow. Manganese bronze intake valve guides ensure long term reliability.